Seares: Jiggy Manicad defended Duterte on media issue. Is that ‘betrayal’? TAKING DUTERTE’S SIDE. Jiggy Manicad, in a Philstar news clip. WHAT did Jiggy Manicad, a GMA 7 broadcaster who quit his job as TV news anchor and is now running for senator, do to be branded “a traitor” by Philippine Daily Inquirer? His comment did not set off a storm of protests, just a scattering of flak, from big-hitters such as the Inquirer and National Union of Journalists to random comments in social media. They thrashed Manicad, arguing on facts and logic. A journalist, Joel Pablo Sanidad, said that other media entities are also being attacked and pressured. He named the Inquirer, news website Bulalat and the broadcasting giant ABS-CBN. “If they don’t constitute an attack against press freedom, what about harassment? Intimidation? Perfect words to describe what is behind the scenes,” Salud said. Those who support Manicad’s view, along with government propagandists at PCOO and the president’s spokesman, and those who disagree with it: the opposing camps can argue to exhaustion that each side is right. What interests us here and now is whether a journalist must be drubbed for giving an opinion, regarding an issue raised in the campaign, which his colleagues disagree with and resent? Did Manicad betray his profession and his former co-workers by expressing “an honest opinion”? Was it an honest opinion? No, it was not if before he joined politics, Manicad as a broadcast commentator held a different view. Did he lash out before at alleged government attempts to intimidate and coerce critical media? Was he a staunch defender of free speech and free press then? Did he push for full access to information and condemn cover-ups and lies? His opinion now wouldn’t be honest if he somersaulted because of expected gain from politics. The attacks on Manicad have not dwelt on a flip-flop or a turnaround. Maybe he didn’t wade into troubled waters before: not exactly the placard-carrying advocate who bristles over sign or suggestion of government repression. Or perhaps when Manicad was a journalist, he backed or leaned towards Duterte. 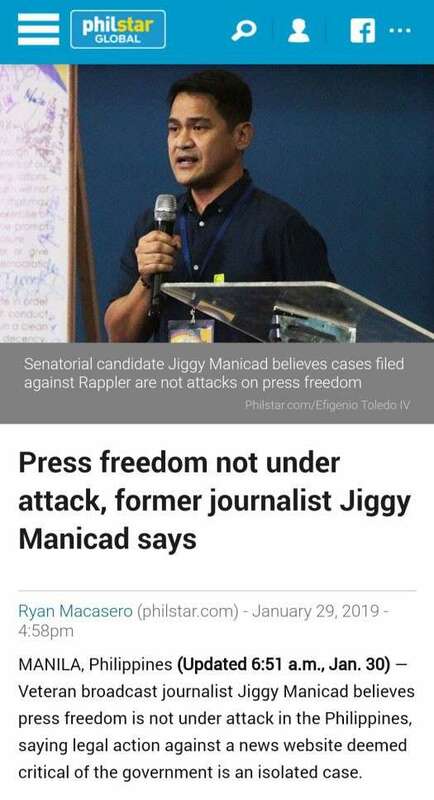 Or was Manicad the sort of journalist who straddled two fences, taking care to get along with his co-journalists but also not to offend his news sources? Manicad, as a former broadcaster, was expected by the Inquirer to take the side of media and the news outfits “threatened” by the government. But Manicad, an independent candidate who takes shelter under the umbrella of Mayor Sara Duterte’s Hugpong ng Pagbabago, was also expected by her party to defend her father’s government. What does media expect, flog Duterte on repression of media and other critics? There are journalists who, without leaving their beats or columns, are cheering the Duterte rule and defending it on the issue of gagging dissent. Given the standard used on Manicad, these pro-Duterte columnists and commentators must be worse than traitors. At least Manicad already “defected” when he took the other side.